Little Zombies: Olivia Bean, Trivia Queen: What is...Jeopardy? 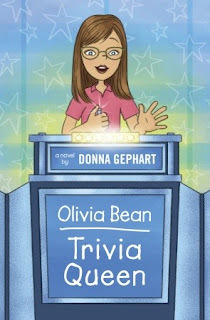 My review: If you like easy reading (which to me is just light reading, not too serious, not too suspenseful), then I hope you will enjoy Olivia Bean, Trivia Queen. The main character is 12 years old and super smart (except for geography). I do enjoy books about super smart kids. As a mother I enjoyed reading the book too and it reminds you to really be there and care about your kids because Olivia's dad was kind of too busy/too self-centered. And it hurts the kids. But don't worry-it wasn't really a preachy book about that. Olivia's got a good head on her shoulder and probably like most kids just want the attention of both parents. Great book for older kids- probably ages 10+. Content Advisory: Parent-child dysfunctions, not married couple (Olivia's mom and boyfriend) living together.